Thursday's dedication of the George W. Bush Presidential Center will be nothing short of a bipartisan lovefest: Former President George W. Bush will host President Obama and the three other living presidents as they unveil the 226,565-square-foot complex at the Southern Methodist University in Dallas. On the outskirts of the campus, however, protesters plan on keeping memories of Mr. Bush's controversial decisions fresh. Less than five years after he left office, those aspects of Mr. Bush's presidency -- the Iraq war, the use of enhanced interrogation, the response to Hurricane Katrina -- are hard to overlook. So in his new library and museum, the former president doesn't try to. Following the theme of his memoir, titled "Decision Points," Mr. Bush's new library appeals to visitors to consider the pressures Mr. Bush faced in office and consider whether they would have made different decisions. Opening and curating the inaugural exhibit of a presidential library -- like writing a memoir or sitting down for softball interviews -- is just one step former presidents take to "rehabilitate" their reputation after leaving office, presidential historian Douglas Brinkley said to CBSNews.com. Mr. Bush may not be able to change the events of his presidency, but he can still influence the way they're perceived. "Basically, you're running for history instead of office," Brinkley said. "Legacy is what matters in the end, and you don't give up the fight just because you're not in Washington anymore." A presidential library, however, isn't just a promotional center for former presidents. Including the George W. Bush Presidential Center, there are 14 presidential libraries and museums administered by the U.S. National Archives and Records Administration. Their construction and opening are paid for by private funds -- more than $500 million was raised for the new Bush complex -- but their upkeep is paid for by U.S. taxpayers. The National Archives expects to spend $68.7 million in administration at the presidential libraries in 2013. "Our collective mission is to promote a further understanding of the presidency and to provide access to historical materials," Susan Donius, director of the Archives' Office of Presidential Libraries, told CBSNews.com, "to further engage the public in the study of the presidency." Donius noted, however, that having a president's point of view on record serves more than just his own self-interest. "If you have the opportunity to come to the Bush Center, you'll see this is a unique story of this president and his history," she said. "He's worked closely with the museum designers to present those key critical moments in his presidency... it gives an interesting perspective, and it's an important historical record of his time in office." Several presidents have established their presidential libraries in their hometowns, and more recently they've been established on or near a university campus. The 13 previously-established libraries in the Archives' system saw more than 1.9 million visitors in 2012. The most popular museum last year was the Ronald Reagan Presidential Library and Museum in Simi Valley, California, which saw more than 380,000 visitors. 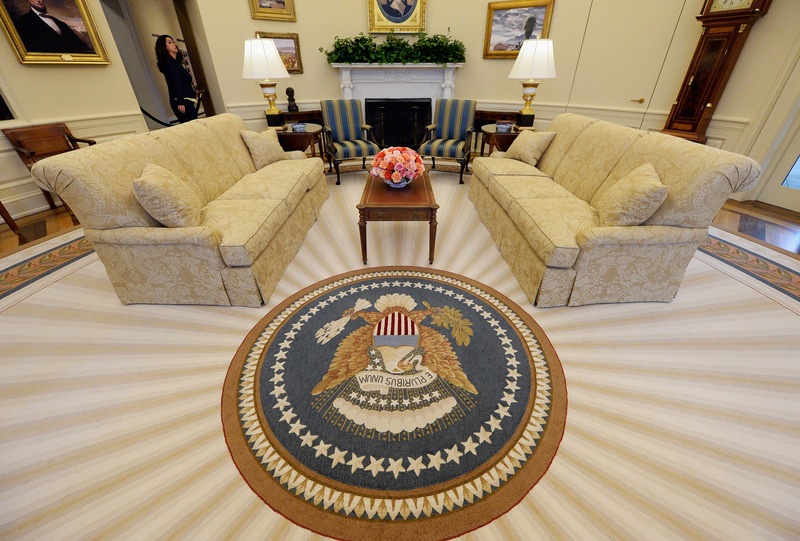 The libraries and museums house vast archives of documents, records, artifacts and other presidential materials. Brinkley, who has visited every presidential library, said establishing them in each president's home state "breaks up the congestion of Washington, D.C."
"If all of these papers were dumped in Washington, it would keep them away from the public," he said. The new Bush Center will include unique artifacts like a Florida voting booth from the 2000 election and the bullhorn Mr. Bush used to speak to first responders at Ground Zero in New York City on September 14, 2001. It also has interactive and multimedia components. Mr. Bush was "the first president of the 21st century and the museum is reflective of that," said Hannah Abney, communications director for the center. In one exhibit, Abney said, visitors "can step into a gaming experience" to consider four big decisions Mr. Bush himself faced in office -- the Iraq invasion, the troop surge, the response to Hurricane Katrina and the financial crisis. The interactive exhibit gives the visitor advice from advisers, and after four minutes, Mr. Bush explains in a video his own decision-making process. "I think the takeaway is... a sense of what that high-pressure decision making is like," Abney said. While the museum touches on controversial aspects of Mr. Bush's eight years in office, Brinkley -- who had an early look at the new center -- said it focuses more on the initiatives that helped define Mr. Bush as a "compassionate conservative," such as No Child Left Behind and combating AIDS in Africa. "At its best, the Bush Library is kind of able to remind people of what it was like to be in America during that decade," Brinkley said. Donius said that the exhibits will naturally evolve with time. "Over time different angles of the presidency are explored, and new events happening in history shed new light," she said. "History carries across administrations, sometimes for decades, so that brings a new lens." When the Clinton Presidential Library and Museum in Little Rock, Arkansas first opened in 1994, it directly addressed, "however fleetingly," as the New York Times reported, former President Clinton's relationship with Monica Lewinsky. Brinkley said it may take years -- decades if former Secretary of State Hillary Clinton runs for office -- before the Lewinsky affair and Mr. Clinton's subsequent impeachment are more fully addressed. Other presidential libraries have broached the less flattering aspects of a president's tenure years after they opened. The Lyndon B. Johnson Library, for instance, now tackles the Vietnam War, Donius said, and the Richard Nixon Library recently updated its Watergate exhibit. When the Truman Library in Independence, Missouri was renovated in 1999, its curators had a chance to take a fresh look at Truman's decision to drop the atomic bomb. The exhibit, called "the decision to drop the bomb," doesn't shy away from the somber consequences, the museum's deputy director Amy Williams told CBSNews.com. It includes footage of the wounded and dead after the bomb was dropped and features a Wall Street-style ticker that lists the number wounded and killed in the war. Video screens show propaganda used by both sides in the war. The Truman museum also invites visitors to write down their thoughts on whether Truman made the right call. "I think we look at everything a little differently with the grace of time," Williams said.